I keep back issues of my favorite gardening magazines as do a lot of gardeners. We justify this magazine “hoarding” by telling ourselves that they are needed “in case I want to refer back”; but rarely do we look at anything in the stack again! Well, I’m here to suggest that we need to periodically check out those not outdated articles, and this blog serves as a good reason! Years ago I subscribed to Flower & Garden, which was published back in the 1990’s – I know since my subscription ended with the January, 1996 issue. 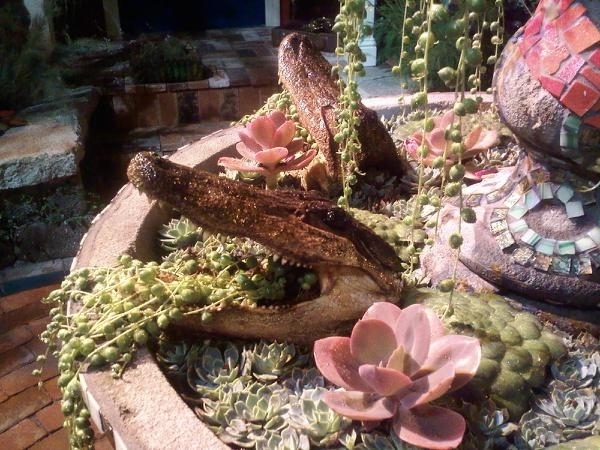 In the 1990’s, it seems that most people thought of succulents as exotic plants. These were meant to be carefully tended, shaded from the direct sun, kept from harsh temperatures, and planted in sandy, rocky soil. Interesting, but since a lot of succulents come from either desert-like climates or cold, windy alpine mountains, it does seem that the coddling “required” was a bit much. Where are the succulents growing in your yard? In the full sun, away from winds (try that in Suisun or Fairfield! ), in crumbly semi-moist soil? Mine are growing like weeds in pots outside in regular potting soil; they get water when “everyone else” does and they don’t get sheltered from the elements! Nope, mine thrive where they are, thanks! The article continues on about picking out the right size pots: for a barrel type cactus, use a pot 1 to 2 inches wider than the plant; for vertical type plants such as aloes use a pot ½ the height of the plant. I don’t have many specimen succulents here. I have creepers mixed with verticals and here and there they are interspersed plants that grow wider than tall. Everything spills, and tumbles out of the pots so that one succulent looks like it belong with the plants in the next pot over. One of my succulents is rangy, with leaves spaced a good 4 inches apart and a rather strange shade of pale green; not an attractive plant BUT when it blooms – wow! – pale yellow bell-shaped flowers abound in a semi-panicle form. It’s just beautiful! And then the flowers are through and it becomes its rather nondescript self. Aloes, Agaves, Crassulas, Echeverias, and Sempervivums are plant groups that fall into the succulent category. Come to the plant exchange on October 12, and see the variety there. Thanks to Elizabeth who came to my house and harvested cuttings, there should be a goodly bunch for you to select from. Come and take the free plantlets and stay to listen to the various mini-talks by the Master Gardeners of Solano County.